What were naval tactics like in Europe during the Middle Ages? 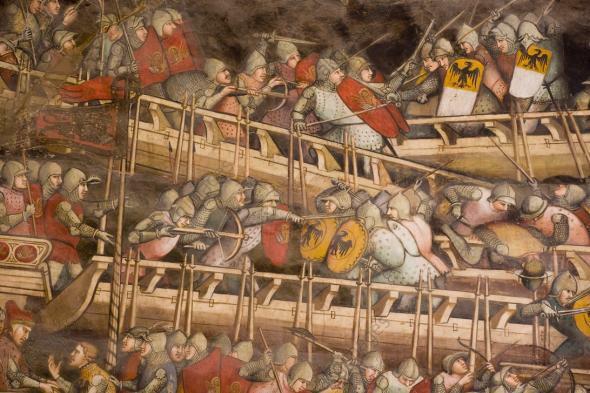 A naval battle off the coast of Sicily, from a fresco by Spinello Aretino, 1407-1408. The Middle Ages describes the period of time from about 500 to 1500. This millennium saw the invention and adoption of many new technologies, but by and large, naval warfare was not particularly affected. The game-changer in naval warfare was the cannon, and although that was invented in China sometime in the 900s at the latest and adopted by Europeans by the mid-1200s, it was very rarely used in shipboard combat until about the back half of the 1500s. The obvious question is why the cannon wasn’t adopted for use in naval combat earlier. The answer is pretty much the same reason why the invention of the internal combustion engine didn’t immediately lead to powered flight: Medieval gunpowder-based artillery was extremely heavy, didn’t give very much bang for the buck, and had a really nasty habit of unexpected blowing up in the users’ faces. It took advances in metallurgy in addition to gun design before gunpowder artillery started being a viable means of blowing holes in ships, which meant carrying cannon on deck during the Middle Ages would have been a waste of space and money. Now, it was possible to get non-gunpowder-based artillery onto a ship at that point. The ballista is essentially an oversized bow-and-arrow, but the bolts it fires are pretty big, which means you only get so many shots. Also, for the most part, it wasn’t all that effective at rupturing the enemy’s hull. It also would have been possible to get some designs of catapult on board, but getting the projectiles to hit the enemy below or near the waterline would have been an extremely difficult shot to make. In short, there wasn’t really a great way to sink your enemy at range, although computer games such as Age of Empires like to pretend otherwise. There were a couple of ways of sinking the enemy close up, though. Some ships, such as triremes (an ancient design of ship, named for the three decks of oarmen who served as the ship’s engine), were built with rams just underneath the waterline. Ideally, you’d maneuver into such a position that you could work up some speed and then slam the ram into your enemy’s hull. Alternatively, if your ship was significantly larger than the enemy, you could simply crash into the enemy and break him apart. (I have no idea how people had the guts to do this, but they did.) Of course, both of these tactics required great maneuverability on your part and rather less on the part of your enemy, so while they were generally effective when employed, they had a pretty limited set of scenarios where they could be potentially used. You could also try setting your enemy on fire, which was an obvious possibility in the days of the wooden ship. The Byzantines did this with a now lost technology called Greek Fire, which was a pyrophoric substance. Putting it another way: The second Greek Fire came into contact with air, it caught alight. It also burned on water. The Byzantines would use hoses to deploy Greek Fire onto enemy vessels, which meant they had to get up close. Still, even if you didn’t have Greek Fire—and again, most people didn’t—you could get much the same effect by taking an old ship you did not care about, getting it into the middle of the enemy’s fleet and then setting the ship alight. You could also tow it near the enemy’s fleet, set it alight and then hope it went the right way. On the one hand, this meant you weren’t sending your crew on a suicide mission. On the other hand, it meant that it was that much more likely you’d set your own fleet on fire. You had to be very careful reading the winds before trying incendiary naval tactics, because the potential cost of using fire was, well, losing everything. Which leads us to what was probably the most relied-on way of dealing with the problem: Send the marines. Get your ship in such a position that you can send a boarding party over to the enemy, and hopefully your boarding party will be able to disable the ship, disable the crew, or just scuttle the ship altogether. Even in the age of the cannon, this was still fairly commonly done in naval warfare, and it’s a comparatively recent development that the primary duty of a state’s marine corps is not to do this. This brings us back to gunpowder. Using it to launch a projectile to disable an enemy ship was generally impractical in the Middle Ages—but using it to start a fire on board an enemy ship or creating a small bomb to potentially breach the hull? Yeah, that worked. Board Games: What are some interesting but not common board games? Middle Ages: What was Europe like under the rule of the Muslims (Moors)? History: How was Hitler able to rebuild Germany so quickly?